Property 3: Family Friendly Home, with a Man Cave! Property 5: Secluded Keaau House w/Hot Tub & Wraparound Porch! Ocean Front Property In Kaloli Pt.. Enjoy Our Low Introductory Rates. Property 15: Ocean Front Property In Kaloli Pt.. Enjoy Our Low Introductory Rates. Property 17: House of Paddles - Large Private Home with Pool. Pali Hale - Hawai'i Oceanfront Experience - Whales, Turtles, Nenes! Property 22: Pali Hale - Hawai'i Oceanfront Experience - Whales, Turtles, Nenes! Kahikole - Oceanfront, private two-story home with AMAZING views and privacy! Property 24: Kahikole - Oceanfront, private two-story home with AMAZING views and privacy! Private & Serene. Artsy Oceanfront Home; Pool & Spa; Bikes; FUN! Property 28: Private & Serene. Artsy Oceanfront Home; Pool & Spa; Bikes; FUN! Private & Secluded Keaau Island Home on 1 Acre! Property 30: Private & Secluded Keaau Island Home on 1 Acre! 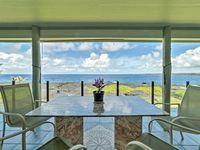 Big Island Oceanfront Home - Great Whale Watching! Property 33: Big Island Oceanfront Home - Great Whale Watching! Lahiki O Ka Hale (House of the Rising Sun) Close to Ocean! Property 35: Lahiki O Ka Hale (House of the Rising Sun) Close to Ocean! Sixty feet from the Blue Pacific - Large Oceanfront Home! Property 36: Sixty feet from the Blue Pacific - Large Oceanfront Home! GORGEOUS EXTREME OCEANFRONT HOME WITH HOT TUB, ANY CLOSER AND YOU'D BE SWIMMING! Property 38: GORGEOUS EXTREME OCEANFRONT HOME WITH HOT TUB, ANY CLOSER AND YOU'D BE SWIMMING! Casa By The Sea! Sleeps 6. Sounds of the Jungle and Ocean.Amazing Jungle Views. Property 41: Casa By The Sea! Sleeps 6. Sounds of the Jungle and Ocean.Amazing Jungle Views. New home on one acre in Hawaiian Paradise Park w/ front & back lanais & grill! Property 42: New home on one acre in Hawaiian Paradise Park w/ front & back lanais & grill! Secluded getaway w/ a tropical yard & furnished, wraparound lanai! Property 43: Secluded getaway w/ a tropical yard & furnished, wraparound lanai! Big Island Romantic Rain Forest Retreat! 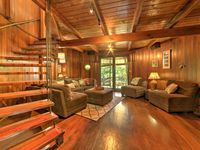 Property 48: Big Island Romantic Rain Forest Retreat! BOOK NOW ... #Hawaiianvacation. Just like a motel, but with NO maid service. Property 50: BOOK NOW ... #Hawaiianvacation. Just like a motel, but with NO maid service. Such a beautiful house with amazing views. We were a party of 4 (2 couples) and the house was perfect for us. This was one of the best houses we have stayed in. The balcony overlooks the ocean which is definitely a sight to behold. The house was well maintained, clean and fully equipped with all basic amenities. Loved the place!